This website promotes where opportunities lie for increased profits, better environmental outcomes and more resilient paddocks to reduce the effect of drought. It is the resting place of conclusions based on knowledge and new understandings that were shared with one person by many of the best and most progressive minds in Australia. It represents the thoughts of leading scientists from many fields, successful and responsible rural producers plus many others. The content is a systems approach to overcome the narrow focus of reductionist science. The natural world can't function without carbon flows. If the fundamental of carbon flows is not managed correctly, then everything else will not fall into place. It is important to remember that long term carbon has to start the journey as short term carbon in the first phase of carbon flows. The grazing industry does not manage long term carbon, it manages short term carbon, long term carbon is an outcome. This poster won "Best Poster Paper" at the 2008 Australian Rangelands Conference. It links management of Carbon inflows to resilience and a raft of other positive outcomes. The unwillingness of the Queensland Department of Agriculture to see logic in including discussion of the carbon flows concept in extension is costing the Queensland economy about $70 million a year on average because of lost production. This figure was arrived at after a leading rangeland scientist suggested going onto the Queensland Treasury website - it is a conservative figure based on just 10% of all sheep and cattle producers achieving a small gain in production, after seeing their paddocks differently and managing their pastures consistent with the carbon flows concept. Apart from poorer commercial outcomes with current government policy, there is increased human stress with droughts arriving sooner and lasting longer. Reduced protection of the Great Barrier Reef is another outcome of current government policy. This peer reviewed paper published in the International Journal of Greenhouse Gas Control makes a strong case for comparing methane and carbon dioxide differently to the way we currently do. The paper does not challenge the science behind greenhouse gases but it does put eating red meat in a better perspective for those concerned about the future. Because the objective of climate policy is to stabilise the climate (i.e. stabilise instantaneous radiative forcing), it would be more constructive to compare ongoing methane emissions (or reductions) to one-off emissions (or reductions) of carbon dioxide. When human induced methane emissions are constant over time (i.e. not increasing), then these ongoing emissions do not change the net balance of radiative forcing. This is because methane has a short atmospheric lifetime of about twelve years and these ongoing methane emissions reach equilibrium in the atmosphere. On the other hand, every single emission of carbon dioxide increases the net balance of radiative forcing. Put simply, any methane emissions released today are contributing to the current climate for twelve years but not the future climate. This paper uses cattle as a case study to show how a one-off sequestration of carbon dioxide on farm offsets all the ongoing methane emissions from the cattle on the farm for many centuries. In 1996, the Australian Government funded research to perfect the use of old man saltbush plantations for resting pastures after rain, as part of the Drought Regional Initiative program. The aim of the research was to perfect the use of saltbush plantations as a management tool to maximise carbon inflows from any rain that arrived. In 2006, the Department of Agriculture Forestry and Fisheries funded the finalisation of technology to produce saltbush seedlings at low cost. A rural producer's day job is in a sense utilising water molecules (rain) to accumulate carbon molecules in the landscape. This exercise is fundamental for profit and maintaining future production. It is past carbon flows that determine water use efficiency. THIS WEBSITE COVERS ASPECTS OF HOW ALL PADDOCKS FUNCTION THAT ARE NOT DISCUSSED BY MAINSTREAM EXTENSION. IT AIMS TO HELP YOU FINE TUNE WHAT YOU ARE ALREADY DOING IF YOU OPERATE A CATTLE OR SHEEP PROPERTY. HOW CARBON ENTERED EXTENSION IS DISCUSSED HERE. # Has extension to the grazing industry focused on the wrong aspect of carbon, when discussing on farm "decision making"? # Do you understand the difference between "carbon flows" and "carbon stocks"? Discussing the carbon flows concept and discussing the carbon cycle diagram are two different discussions. The carbon flows concept explains the role of moving carbon and how to increase flows, while the carbon cycle diagram simply shows the different pools carbon moves between. The carbon flows concept discusses feedback loops, such as how past flows influence the level of current flows. Long term carbon is a very low percentage of flowing carbon in the landscape. Think different carbon speeds to better understand the different aspects of resilience. # This presentation to a meeting of Grazing BMP Coordinators (Queensland) focused on the very basics of how a paddock functions and how to improve production/environmental outcomes. It explained how discussing the "carbon flows" concept helps producers see their paddocks differently. After a billboard opened the debate about carbon flows being discussed in extension, the Queensland Department of Agriculture, which is responsible for taking the lead in extension, held a workshop. Unfortunately the department decided there was no need to raise the carbon flows concept with extension officers, nor the need for a standalone carbon module. There is support outside government. The public responded to the department giving lip service to the carbon flows concept. 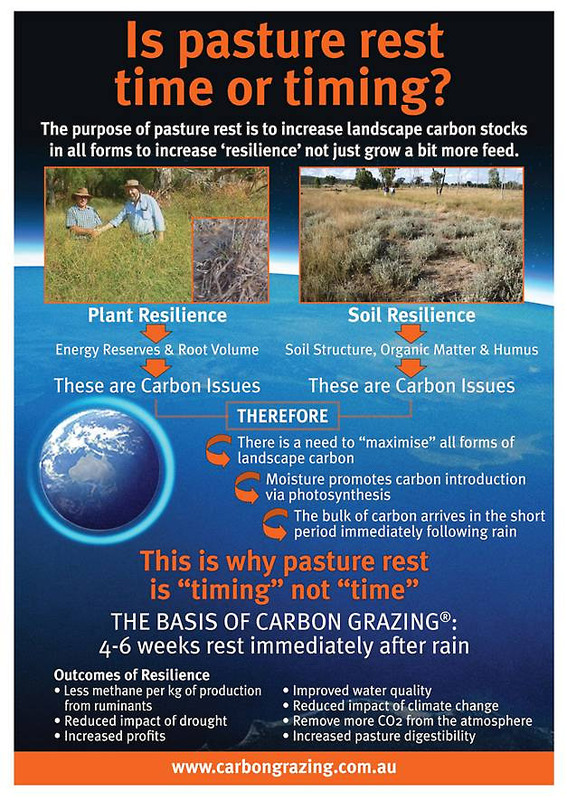 The Carbon Grazing principle relates to maximising carbon flows. Good management of carbon flows is essential for sustainable food production. 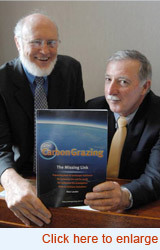 The book "Carbon Grazing - The Missing Link" was launched by Dr John Williams the former head of CSIRO Land and Water. This book moves beyond carbon stocks, which are outcomes, to include discussion of carbon flows, why they are important and what they do. The book was made compulsory reading for a course at the Colorado State University in America. There have been ongoing comments about the simplicity of language used when explaining complex concepts. The Missing Link in the carbon debate is not paying enough attention to the time when the bulk of the carbon transfers from the atmosphere to the landscape, to keep it productive and resilient. Reasons for the slow uptake in explaining the importance of the carbon flows concept to rural producers. "Unsettled science: Timing the harvest of carbon flows". Proceedings of the Royal Society of Queensland 2014. "When everyone thinks alike, no one thinks very much"
How to reduce methane and increase profits at the same time. In a country where we have the most unreliable rainfall in the world, the emphasis has to be on increasing the percentage of perennial plants, be they grasses or shrubs. The potential opportunities that edible shrubs supply should be considered in the broader context of systems analysis. If you are not thinking carbon flows and the importance of carbon in the context of how your paddock functions - then you are not going to be thinking about "when the bulk of the carbon arrives".